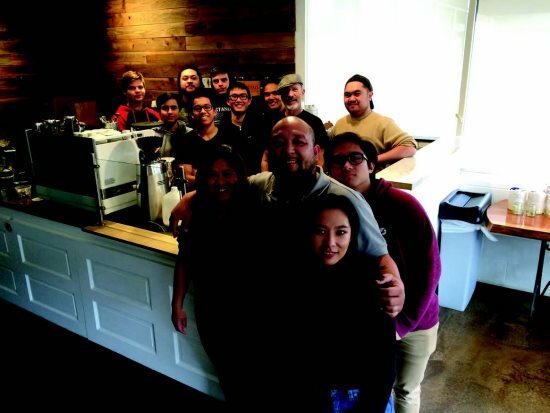 John and Rose Reyna opened their doors to the public for the first time at 5:30 a.m. Monday, March 5, giving day-breakers the opportunity to taste the organic coffees and teas, and the homemade breads and pastry of the new restaurant in town. 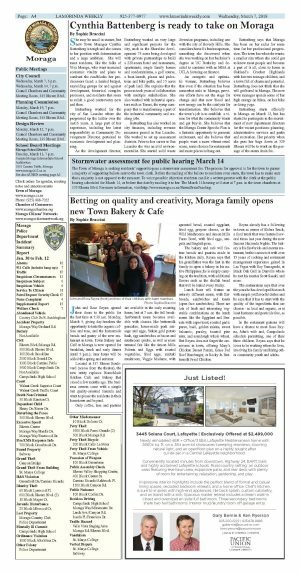 Town Bakery and Café in Moraga is now opened for breakfast, lunch and early dinner (until 5 p.m.); later hours will be added this spring and summer. Located at 337 Rheem Boulevard (across from the theater), the new entity replaces HomeMade Kitchen Cafe and Bakery that closed a few months ago. The business owners come with a simple but quality-oriented formula and want to please the residents in their hometown and beyond. Only coffee, teas and pastries are available in the early morning hours, but at 7 a.m. the full breakfast/brunch menu becomes available with classics like buttermilk pancakes, house-made pork sausage and eggs, Yukon gold potato hash, egg sandwiches or bacon and mushroom quiche, as well as more unusual fair like the Anson Mills Polenta and Eggs with roasted vegetables, fried eggs, maitaki mushroom, Veggie Madame, with sprouted bread, roasted eggplant, fried egg, gruyere cheese, or the Wild Mushrooms and Anson Mills Farro Bowl, with fried eggs, arugula and English peas. The bakery and cafe will feature breads and pastries made in the kitchen daily. Reyna says that his grandfather was the first in the family to open a bakery in his native Philippines; he is simply carrying on the tradition, with additional flavors such as the challah bread that will be baked every Friday. Lunch hour will feature an entirely different menu, with flatbreads, sandwiches and toasts (open face sandwiches). There are lots of fresh and interesting vegetable combinations on the lunch menu like the Eggplant and Burrata with caper toast, roasted garlic puree, basil, golden raisins, sweet balsamic, parsley, toasted pine nuts, and sourdough whole wheat. But Reyna does not forget the omnivores in town, offering Mary's Chicken Breast Panini, Grass Fed Beef Hamburger, or Rocky Jr. Buttermilk Fried Chicken. Reyna already has a following in town as owner of Sliders Truck, a food truck that was featured several times last year during the now famous Hacienda Nights. The bakery is his first brick-and-mortar restaurant, but he comes to it with over 15 years of cooking and restaurant management experience gained in Las Vegas with Roy Yamaguchi, at Black Oak Grill in Danville where he met his mentor Scott Sasaki, and more. The restaurateur says that over the years he has developed his touch with simple yet flavorful dishes and he says that it has to start with the quality of the ingredients that are chosen - as local and organic, or at least hormone and pesticide free, as possible. In the restaurant patrons will have a chance to meet Rose Reyna, John's wife and, Campolindo schedule permitting, one of their three children. Reyna says that he loves to be working where he lives, involving his family and hiring other community youth and adults.